Hello Loverlies! I finally got around finishing Paper Towns by John Green. I will warn you, my review has SPOILER ALERT to it. 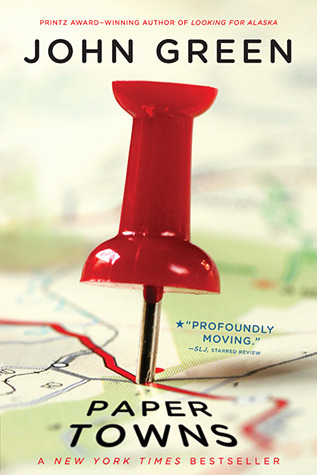 Paper Towns is about a girl named Margo Roth Spiegelman and a boy named Quinton Jacobsen. It starts off talking about what happens to them when they are young, and then it goes into when they are at high school. Of course, like many friendships they’ve grown apart over the years and started hanging out with different friends. One night Margo decides to go to Quinton’s house and enlist him in her plan for vengeance. Vengeance against old friends whom have lost her trust in various ways. Her parent’s inform us that she has gone missing and that this isn’t the first time. She left town because of her estranged relationship with her parents. But this time she decided to leave clues for Quinton to follow. I lost interest in the plot of this book because the search for Margo becomes repetitive after a while. The consequence of this leaves me feeling that Margo comes off as a very shallow and selfish character. It made it hard to like her character. When Quentin Finds Margo she elaborates on all the reasons why she left. I feel like the book needed a stronger narrative in the middle instead of the repetitious searching. Also the body of the book wasn’t proportionate to my liking. Even though, the end was definitely stronger then the rest of the book, It read as if there was rambling nonsense to it. I don’t believe that I will read it again. Even though I was disappointed in this book, I will read other books by John Green in the future. Pick up the book yourself to see if you enjoy it, you may like it better. Have a Blessed Day!